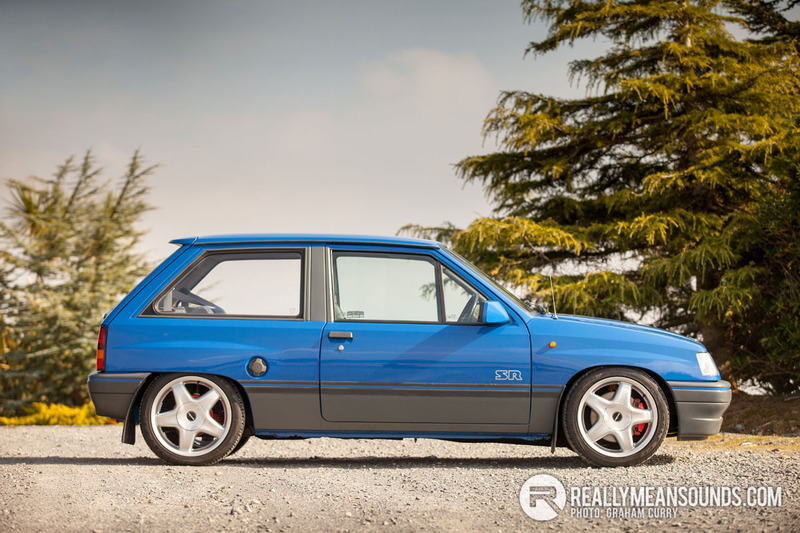 I collected this Vauxhall Nova SR from Ricky at RB Automotive in Comber to photograph it and bring you yet another 80’s classic feature. After stepping out of a brand new Audi RS3 Sportback it was quite a chore to drive this 1991 Nova SR and to say the least, we forget (or at least I had) just how far cars have progressed over the last twenty plus years and indeed somewhat take it for granted just how easy modern cars really are to drive. No power steering, no fancy driving aids and the icing on the cake for this car was the brand new 1600cc 8 valve Ivor Greenwood racing engine with twin 45 Weber carburettors, electric fuel pump and a four branch manifold and full Ashley Competition exhaust system. This engine produces more than double what the standard 1300cc engines produced in the late eighties and revved in a way I did not expect at all, simply sublime! Ricky spent plenty of time and money on this Nova as it has had a full bare shell restoration using the best second hand parts available to buy as most new parts are no longer available and it was painted inside and out (including underneath) in Vauxhall Breeze Blue which is in my opinion was one of the nicest colours available back in the day. To aid the chassis Ricky fitted an OMP strut brace under the bonnet with G Mac suspension matched to up rated Chassis Dynamics springs stiffening the ride up and the handling was further complimented with the addition of Polyurethene bushes throughout. Grip wise Ricky added the finest Goodyear Eagle tyres to the 16” Speedline Alessio 2 alloy wheels and the grip from these combined with the big brake kit sourced from a Vauxhall Cavalier SRi ensures plenty of stopping power and cornering grip. Inside got the restoration treatment also and it took several second hand full interior purchases to get a perfect pair of front seats and some re-trimming was carried out by Arek Car Design in Ballymena to keep the inside as immaculate at the outer. This has to be one of the cleanest and most immaculate Novas I have driven and the overall experience was like a young person’s first kiss; anticipated, memorable and one that leaves a lasting smile on your face! That is stunning. Perfect nova upgrades. Amazing. I would love that! I think "challenge" might have been a better use of words than "chore" lol. But great work as always @Graham Car looks great @Ricky must be a hoot to drive with that engine!?! | I think "challenge" might have been a better use of words than "chore" lol. But great work as always @Graham Car looks great @Ricky must be a hoot to drive with that engine!?! Had a look round this at Kilbroney this year. Some condition. Did you try the hazard warning switch trick to see if it still works . Used to win a few bets back in the days when not many people knew about that wee trick, would have bet mates i could drive away in there SR even if they held the keys.....innocent fun.